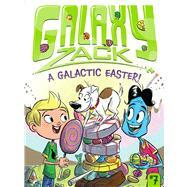 Galaxy Zack has some “sweet” competition in this Easter-themed chapter book adventure! Zack and Drake venture to Gluco, the candy planet, for some Easter fun. Once there, the two friends decide to compete in activities, including an egg toss and a three-legged race. Zack remembers how he used to win all the Easter competitions on Earth, and he is determined to win them on Gluco, too. With the contest so close, Zack begins to wonder if he should cheat to ensure victory. Will Zack have to choose between playing fair or coming out on top?